There is no question that the conversation surrounding construction defect litigation and legislation is both intensifying and that it has changed tone. Instead of being a dispute between the residential construction industry and homeowners, it has become a conversation between advocates for affordable housing on the one hand and plaintiffs’ construction defect attorneys, speaking either through the Community Association Institute or the Build Our Homes Right Coalition, on the other. On December 10th, the CDLA will host a seminar focused on this discussion, where it has been, and where it is going. Tom Clark is the Chief Executive Officer of the Metro Denver Economic Development Corporation and is currently involved with the Homeownership Opportunity Alliance. The HOA is a broad based coalition that supports a balanced, reasonable, and common-sense approach to improving the current legal environment, meeting the demands of home buyers, increasing the supply of affordable housing, and promoting the repair of defects and protecting the rights of consumers. Mr. Clark will discuss the legislative reform efforts over the last two years, and provide a preview for what may be in store for the 2015 legislative session. Ms. Talbert is the Senior Vice President of Public Affairs and Executive Director of the Metro Housing Coalition Political Committee for the Home Builders Association of Metro Denver. Ms. Talbert is very involved in local politics in the Denver metro area and has been orchestrating the local efforts to address the affordable housing crisis throughout the Denver area. She was instrumental in the passage of Lakewood’s much-discussed Ordinance No. 2014-21, Parker’s less-discussed Ordinance No. 9.217.1 and she is involved in similar efforts in other local jurisdictions. Ms. Talbert will discuss the history behind addressing construction defect reform at the local level, provide some context for the various approaches taken by different jurisdictions, and provide some insight for what other jurisdictions may be contemplating. 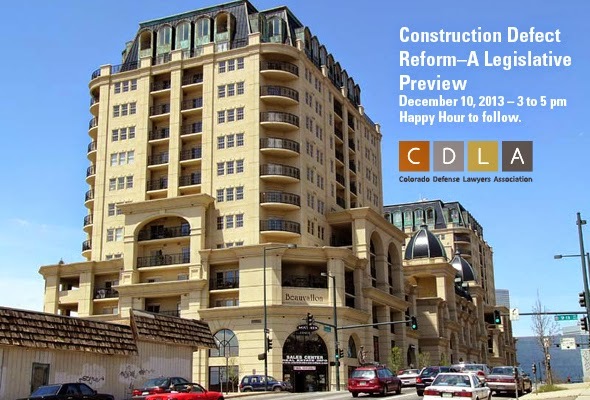 This panel discussion is intended to be an open forum and sharing of opinions and ideas among those typically involved in construction defect litigation, including counsel for the general contractor/developer, subcontractors, and design professionals, coverage counsel for both the insurer and the insured, and a representative of the insurance industry. If the legislature takes this issue up in the 2015 legislative session and it results in any legislation being passed, it is likely that the issue will not be addressed again in the foreseeable future. With that in mind, it is imperative that the legislation put forward actually moves the needle with respect to the size and frequency of construction defect lawsuits. Come share your thoughts regarding what might actually make a difference. There is no question that the conversation surrounding construction defect litigation and legislation is both intensifying and that it has changed tone.